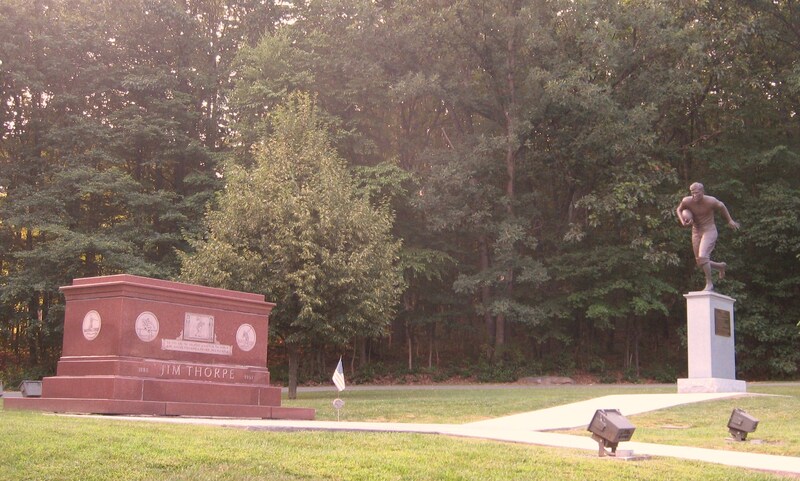 A ceremony to honor legendary athlete Jim Thorpe will be held at his burial site on Saturday at 10 a.m. Tomorrow should be a beautiful day in Jim Thorpe and not just because the sun is expected to shine after a week of rain. The spirit of the enchanting town that greets visitors as they wind around the Lehigh Gorge will also shine tomorrow as it pays tribute to the legendary Native American athlete for whom it is named, just as it has done for 15 years. A Native American ceremony and the unveiling of a new statue honoring the “greatest athlete in the world” will be held at the site where the Jim Thorpe Memorial Mausoleum Committee in 1957 laid earth from the Prague, Oklahoma farm where Thorpe was born, as well as soil from Saupula, Oklahoma, the Polo Grounds (the former home of the New York Giants, where Thorpe played), the pitching mound of Indian Field at the Carlisle Indian School, as well as the Olympic Stadium in Stockholm, Sweden where Thorpe won the decathlon and pentathlon. Thorpe and his brother Richard, along with the Sac and Fox tribe recently joined a lawsuit against the town initiated by the athlete’s youngest son, Jack Thorpe, who died in February, to remove the Olympic hero and return him to be buried in Oklahoma. Thorpe’s eldest grandson, Michael Koehler, will be in town for the tributes. Koehler, as his mother Charlotte did before her death, recognizes the town as “honorable hosts” of his grandfather’s remains and encouraged the town to continue to challenge the lawsuit with the same “fighting spirit” as Jim Thorpe, according to the Times article. Rest in Peace, Bright Path. 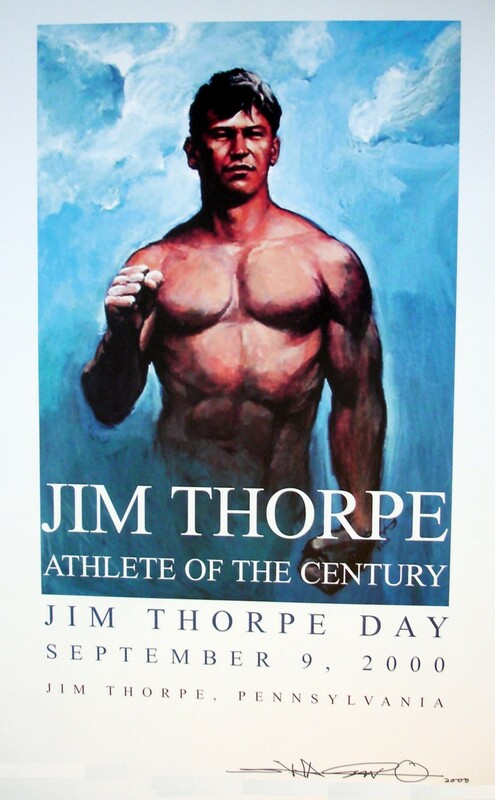 Acclaimed artist Shozo Nagano created this rendering of Jim Thorpe for the celebration of Jim Thorpe Day 2000. Jim Thorpe is an ordinary American town. It has never tried to be anything else. People come here to see Main Street America, a place connected to the past, because in Jim Thorpe it’s still alive. Deep within this tiny valley some quality we associate with a more innocent time exists. Its spirit has not been crushed by the crassness of American mall culture. I’ve come to realize after living here for nearly thirty years, there’s something special about this place. This is the reason it’s become a popular tourist destination. This is why Grace Thorpe, Jim Thorpe’s oldest daughter, was so supportive of his presence here. Being an educated woman of Native American descent, Grace recognized the magic of ordinary things. Connecting with the people of this place, she appreciated the sincerity with which we honored her father. She also appreciated his significance not only as a Native American, but as a Native American hero, and what that meant to a small Pennsylvania town stripped of its coal just as Jim Thorpe was stripped of his medals. Grace Thorpe understood that rising to higher levels on the stepping stones of our dead selves could apply both to a town and to a hero. In September of 2000, for the Jim Thorpe Birthday Celebration, Shozo Nagano, a local Japanese-born artist, was asked by the Jim Thorpe National Bank to design a poster. I helped to coordinate this project. Shozo was at first reluctant to commit to the work until he had a vision in a place he often went to for meditation: The “Indian Steps” climb up Mount Pisgah near the lake, so-called because they follow an Indian trail that crossed this valley to the Moravian settlement of Gnaddenhuetten, where an Indian massacre took place in the 1700s. In his vision at the top of the “Indian Steps, Shozo saw the spirit of a young Jim Thorpe running through the clouds. The spirit had a message for him: a message of happiness and love. This vision became the design for his poster. I remember, because I did the layout for the printer at the Times News. The birthday gathering brought a diversity of people to the main room of what is now called Penn’s Peak, where a peace-beyond-understanding prevailed. Out of the corner of my eye, I saw Shozo Nagano speaking with Grace Thorpe. The vision remains poised in my mind: an ample Indian woman, looking much like her father, holding the tiny hands of a Japanese artist. It is unfortunate, in my opinion, that not all members of the family share this view. But even more disappointing is the litigious cunning that passes for justice today in America. Early Sunday evening I decided to drive over to the East side and make a visit to Jim Thorpe’s memorial and monument to get a sense of the place without many people around and for a short respite from drenching humidity in an air-conditioned car. While the granite that entombs Thorpe’s body is carved with images of his athletic feats and displays King Gustav of Sweden’s quote at the 1912 Olympics, “Sir, you are the greatest athlete in the world,” what struck me was Thorpe’s carved face atop his football statue. I wondered what he would say about the burial controversy and his son’s lawsuit to bring his body back to Oklahoma. Jack Thorpe may believe his father’s spirit can’t rest unless he’s buried in Oklahoma, however, according to a May 29, 1957 Jim Thorpe Times News article, the folks of Jim Thorpe took great care in their perpetual tribute. 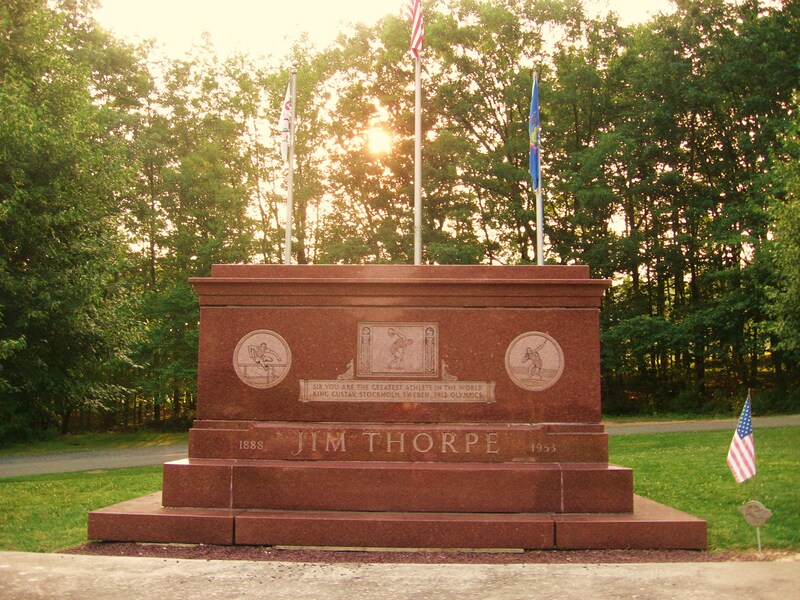 The Jim Thorpe Memorial Mausoleum Committee not only brought earth from the Prague, Oklahoma farm where Thorpe was born, but also soil from Saupula, Oklahoma, the Polo Grounds (the former home of the New York Giants, where Thorpe played), the pitching mound of Indian Field at the Carlisle Indian School, as well as the Olympic Stadium in Stockholm, Sweden where Thorpe won the decathlon and pentathlon. I don’t presume to know what Jim Thorpe would have thought and with all due respect to his son’s beliefs, this tree surrounded memorial on Joe Boyle Circle exudes peace and honor. Welcome friends and folks interested in Jim Thorpe, the man, the legend, and the beautiful town in Pennsylvania — the gateway to the Pocono Mountains, the Switzerland of America. There is always a lot to talk about in Jim Thorpe — the arts, history, architecture, adventure, and even ghosts. I plan to talk about it all. 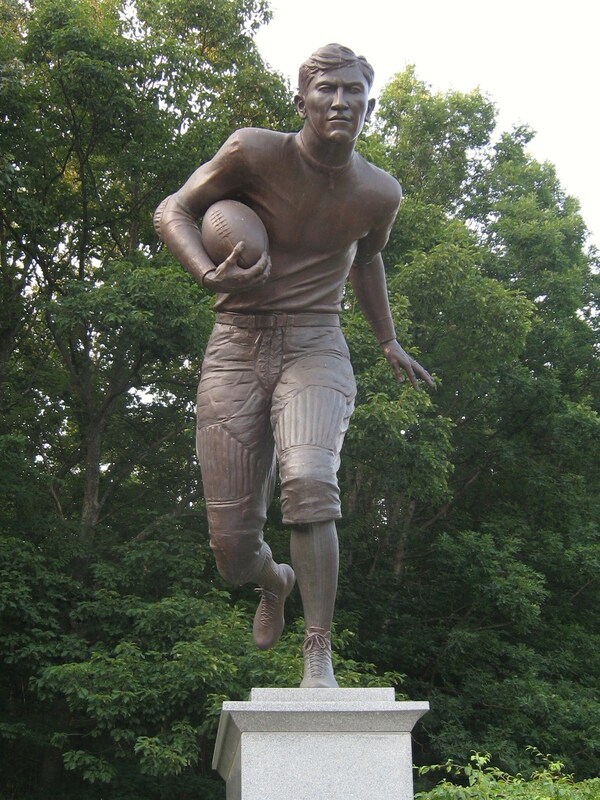 However, now that Jim Thorpe’s son is suing our town to bring his father’s body back to Oklahoma, in the coming days we’ll examine the original deal, how it came to be, some thoughts from folks in town who were around at the time, and how Jim Thorpe, PA has honored Jim Thorpe, the man and his memory. I write this now from the old Times-News building, which operated here on Race Street from 1927 to 1967, during which its longtime editor Joe Boyle started the nickel-a-week campaign that ultimately brought Jim Thorpe’s body and name to the towns of Mauch Chunk and East Mauch Chunk. As a reporter who has written for two newspapers with Times in their names – and continues to write for the Northeast Times in Philadelphia, I have a special affinity and respect for the story and for the people who brought it all to life. I look forward to sharing it with you.